Louis Bellon, born in Dijon, began to draw at the age of 14. Enrolled in the School of Fine Arts in Lyon, he was taught by Antoine Chartres, an extremely cultivated professor who introduced his young pupil to both art and literature. 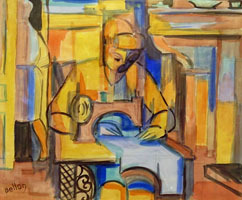 Bellon was also influenced by the works of André Lhote which he encountered a few years later. Bellon drew his inspiration from a multitude of sources: the Neo-Impressionism of Georges Seurat, the flat colors of the Nabis, the intimacy of works by Pierre Bonnard, the subtle delicacy of Paul Cézanne, the Cubism of Georges Braque, Pablo Picasso, and Jacques Villon, both the exciting palette of Matisse and the richness of his line, the Orphism (so named by the poet Guillaume Apollinaire) of Robert and Sonia Delaunay. 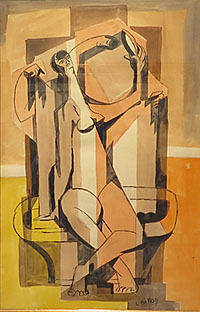 In 1938, Bellon was elected a member of the Salon of the South-East, one of the most prestigious arts organizations of Lyon where many important contemporary artists exhibited. It was there that Bellon met the Nabi painter Paul Sérusier, allied himself with the Cubist Albert Gleizes, and discovered in the work of Paul Klee an artistic inspiration similar to his own. 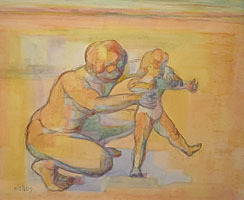 His work is found in the Museum of Modern Art of Lyon and in numerous private collections.